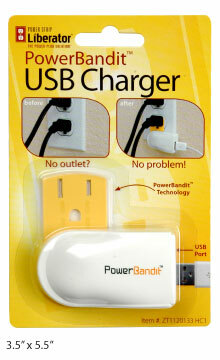 The Power Strip Liberator Power Bandit squeezes itself between an existing power plug and an outlet, providing a single USB power port for charging mobile devices... without blocking any outlets! The slim plate that slides onto a power plug uses hidden contacts to conduct electricity. Able to rotate 270 degrees, the outlet plate swivels away for travel.